I won a scholarship to a posh school. I was very unhappy there, and one of the things which made me unhappy was that when we were around fifteen, we boys all had to join the cadet force. This was split into two main groups; RAF and Army. The RAF group got to play with gliders, so everyone wanted to do that. I was not one of the lucky ones chosen. I had to join the Army group. Being in the cadet force meant that the school bullies usually got made sergeants, so that they actually had some authority as bullies. The first year of the cadet force involved a lot of drilling and marching. Also, one stormy March evening we were dropped off in groups of about five all over the Essex countryside, and required to make our way in the dark to an army camp out in the marshes. We could have got lost, but by the middle of the night the clouds and blown away and the rain stopped, and one of our number could navigate by the stars. I could do that myself now, but I knew little of astronomy then. Incidentally, our navigator later became a radio amateur. At the beginning of the second year in the Army cadet force, we could choose to specialise. Some sections still involved drilling, but the two “skive” sections were perceived as the Signals and the Bearer section, which involved First Aid and stretchers. I wanted to join Signals, but again was “unlucky”. I got Bearer Section. On the plus side, I learned CPR and how to bandage people’s wounds, and it was useful grounding with later refreshers at various work places. I might still be able to be useful if called upon, though I never have been required. However, back to radio. I and a couple of other lads hung about the Signals hut. It was full of old Army radio equipment. I remember they mostly used a WS C12 to talk to other cadet force teachers and lads around the country. I was most impressed. That is when I got the radio bug, and I and a couple of my friends each bought a Nineteen Set (Wireless Set No. 19). Mine cost £12 in around 1967. It was a fortune in pocket money. So, I discovered Top Band AM. I had a huge amount of fun with my Nineteen Set, but more of that later. Did you start in radio with gear from ancient times? Useful info on a handy little rig. 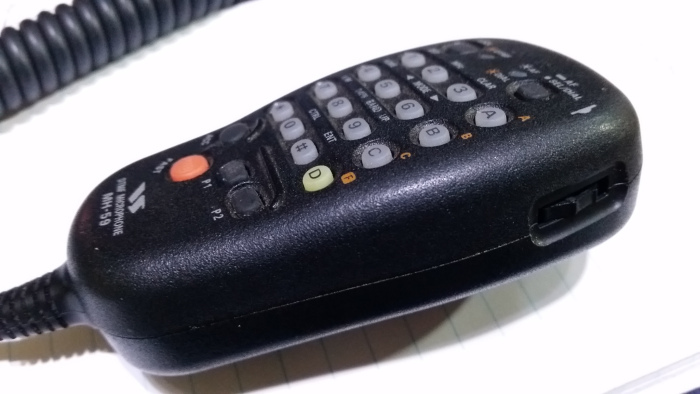 MH-59 A8J DTMF Microphone. The VFO thumbwheel is pictured on the edge of the microphone. P1 and P2 buttons are programmable to give you direct access to two selected menus. Always keep your eyes open in the countryside. You might get a bonus like this. 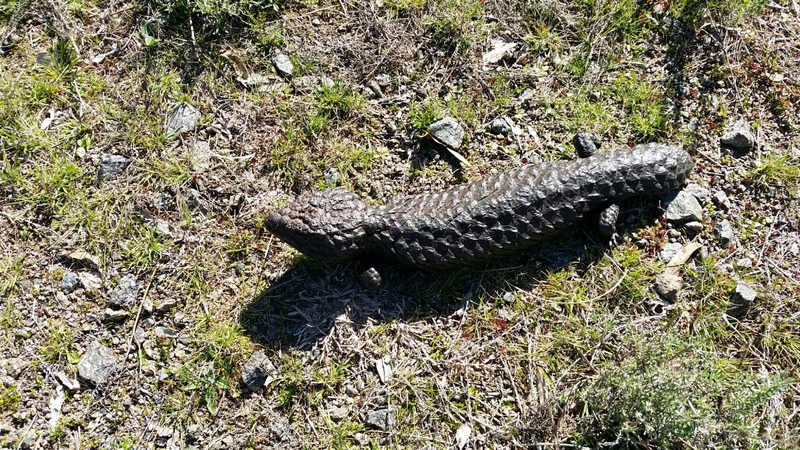 Walking at lunch today I passed this perfect specimen of the Shingleback. Length is about 350mm or 14 inches in the old scale. 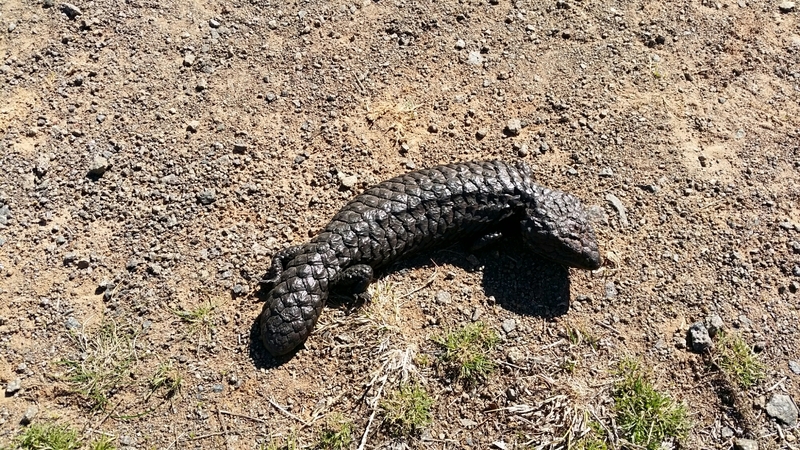 The shingleback lizard is native to Australia. The name ‘Stumpy’ is from the short tail. Canberra is well-known as the bush capital. Welcome, friend, to the home of GMT. A while back I bought a rig on eBay, but the seller had included this with a job lot of miscellaneous items. In the box were three linear amplifiers. One was for 27 MHz which is of no interest to me and I will sell on. Another is one for 144 MHz. That is going to need a workaround as it was made for a specific transceiver way back, and I need to find a way to switch it as it has no RF sensing and I have no manual yet. The third item was a Wood and Douglas amplifier for 432 MHz. It must date from the late seventies or early eighties. It is a solid piece of equipment. The seller said on eBay it was a maximum of 10 watts in for 30 watts out, but I have been reluctant to put it on dummy load to test it. I had no manual and there was nothing on the internet to help. It is a rare beastie. 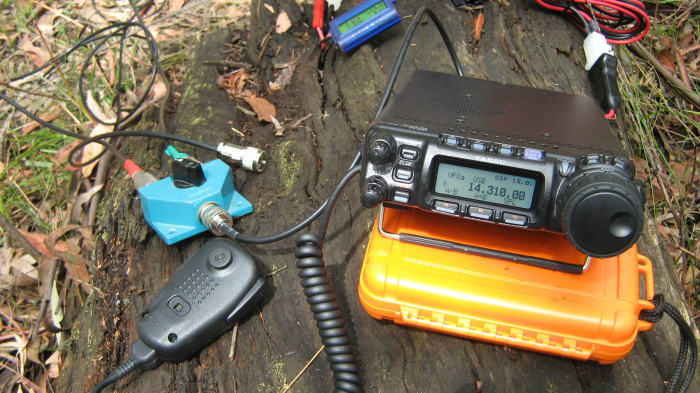 Wood and Douglas was started by two radio amateurs in the late seventies to build and sell amplifiers, preamps and other amateur radio gear, but since has become a grown-up player. It has moved far beyond its original business. On the off chance I sent an email via the website to ask if they had a manual or some instructions for this ancient amplifier. They emailed me back the next day with the instructions / spec which would have been sent out over thirty years ago when the amp was new. This is absolutely brilliant customer service provided to someone who was not even a customer, but just someone asking a favour. It is great credit to the company that they helped me out, so three cheers for Wood and Douglas. Thank you very much. One more thing. The amp is a maximum 3 watts in for 30 out according to the manual, so it is just as well I did not try to overload it having relied on the seller. I am sure he had forgotten after not using it for many years. With any luck I have a usable amp for 70 cms.